Malcolm had a feeling they were wrong, though. If he could leap high enough, if he were strong enough to defeat the pull of gravity and of water resistance to gain sufficient altitude, he was certain it would be possible. After all, his true love Eleanor was in the next fish tank over. He’d watched her, circling, the water flowing gracefully over her gills, her tail fins flipping luxuriously, for days and days. He was determined to reach her. He could only try. Early in the morning, after a good night’s rest and a full early morning meal, he circled in his own tank, building up speed and momentum. Up and up he went, pushing back water furiously, heading for the surface. Malcolm was a whirlwind of speed and energy and muscle, leaping his way toward his destiny. 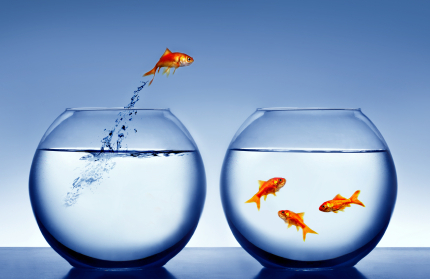 About this post: I couldn’t resist this goldfish bowl image for “thinking outside the box” – in this case, outside the fish tank – yet it was a challenge to try to make a goldfish sound as powerful as a shark. Zero to Hero update: Today is Day 5 of the Zero to Hero blog improvement challenge, and yesterday our task was to connect to the community by identifying other blogs and topics of interest to follow. One stunning blog I discovered is a collection of cutting-edge illustrators’ work. Very inspiring – really fun to browse! illustrationage.com.